As a geek, many people believe me to be predisposed to loving all film adaptations of my beloved source material. Sadly, this is completely untrue. In fact, I’m more cynical than most would be when it comes to messing around with something that I know as well my own reflection. But I try to judge these things as separate works- they do exist in a completely sealed bubble all their own. All that being said? "Spiderman 3" was terrible. Harry is an awful villain and he gets amnesia for his troubles. The upshot is that Pete gets his buddy back, good thing too because his love life is in the crapper. Poor MJ (Kirsten Dunst) is mopey about her career and her boyfriends’ inability to recognize her sadness troubles her. But how can Peter care about MJ’s issues when he’s just found out his uncle’s killer is still at large in the person of Flint "Sandman" Marko (Thomas Haden Church)? He can’t, luckily a mysterious alien goo comes along and turns Pete into a rageful emokid with delusions of tool-ocity which allows him to woo the comely Gwen Stacey (Bryce Dallas Howard) and royally peeve her ex/Peter’s career rival Eddie Brock (Topher Grace). And that’s just the setup! The central issue I had with this film is described above, the sheer weight of the amount of plot contained therein. It basically is covering 15 years of Spiderman mythos in 148 minutes (And that is a marathon runtime for a comic). And, sadly it doesn’t cover any of these points fully, logically, or in a way true to their history. 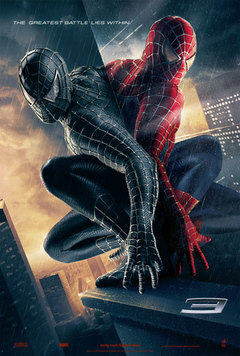 The big media push for this film was the appearance of Spidey’s famous (or perhaps infamous) black costume. This saga is a benchmark in the Spiderman comic universe and could’ve been the entire plot of this film. The descent into darkness, the return to yourself could’ve been nice. Even if they wanted to shove in the eventual appearance of Venom, the ultimate culmination of the black costume, it still could’ve worked. But then they got greedy. "Why not put in Pete’s dead-ex Gwen? Sure we can tweak that. Harry’s still evil right? Yeah…ok that too. We got a movie! Well if we’re doing black suit, then we can’t have Venom as the villain until the end so who will be our bad guy? How about…Sandman?" Along the way though, even all the potential action got sucked out in favor of an emotional journey-which isn’t really even fully explored- that leads to perhaps the sappiest ending I’ve ever seen. All of the humor of the character, the devil-may-care charm that has made the character so popular was removed in favor staring, whining, and languid pacing. And, of course there’s dialogue that would make even the heartiest fanboy wince. While the film ends with sequel possibility, I for one firmly hope they leave well enough alone. My affection for filmic versions of Spiderman can only go so far. That limit was met and exceeded by Peter "Petrelli" Parker Swing Kids-ing his way through the most painfully awkward and ill-advised make-a-girl-jealous scene ever conceived of. No, I think Spidey’s celluloid web-slinging is at it’s end.